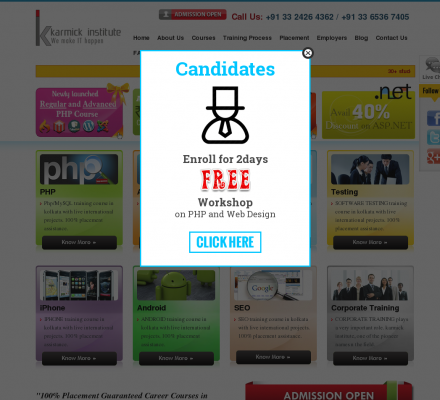 Karmick Institute - Avail world-class practical training on PHP MySQL, Ajax ,Web Design, ASP. Avail world-class practical training on PHP MySQL, Ajax ,Web Design, ASP.NET and Software Testing along with an opportunity to work on live projects using the latest web technologies directly from the industry experts at Karmick Institute in Kolkata, India. Description: Avail world-class practical training on PHP MySQL, Web Design, ASP.NET and Software Testing along with an opportunity to work on live projects using the latest web technologies directly from the industry experts at Karmick Institute in Kolkata, India.